In November, CA’s Andover office commenced excavation on a 2ha site in Hampshire, funded by Persimmon Homes. 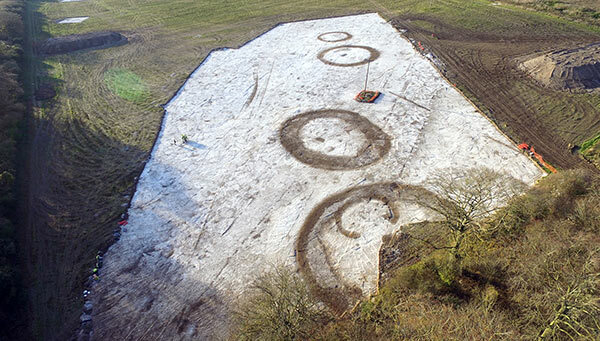 Previously the site had been subject to evaluation by Wessex Archaeology and geophysical survey by GSB. The site occupies the southwest facing aspect of a shallow spur at the confluence of two gentle coombes; one to the north, the other to the east. The earlier works identified areas of key archaeological significance, including a small group of ring ditches to the east, and domestic settlement extending along the western facing slopes of the northern coombe. The excavation was split into seven distinct areas, in order to target a variety of features identified during the earlier works. 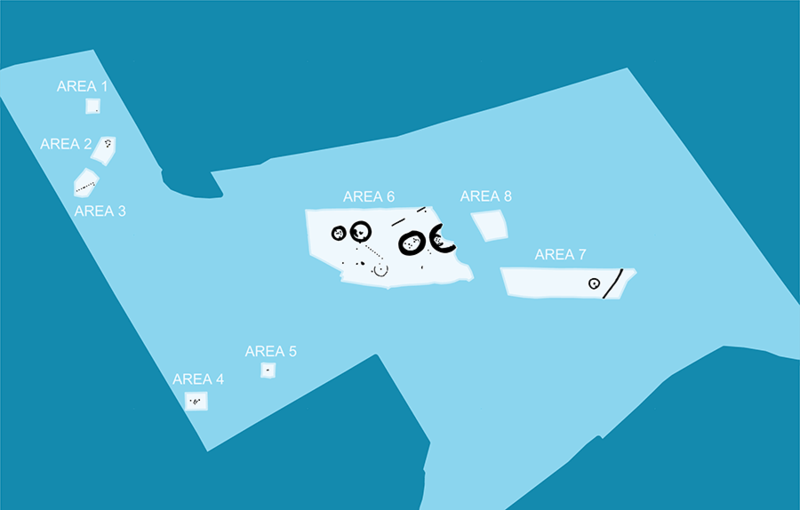 Areas 1 to 5 targeted isolated discrete features identified during the evaluation. Despite their small size, these areas revealed a cluster of 8 cremations, a small round house and a posthole alignment. The largest area, Area 6 , targeted four large ring ditches, thought to represent the remains of four Bronze Age round barrows. 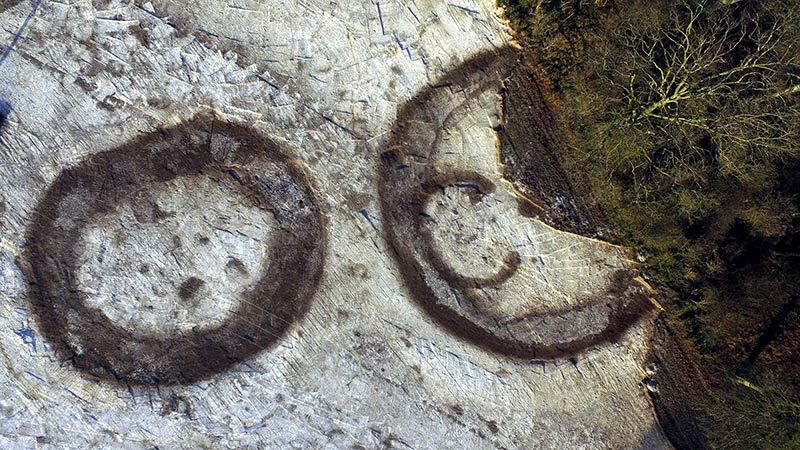 Following stripping, it became evident that these features were indeed round barrows, each containing either central burials or cremations; in some cases, both. The two largest barrows comprised ditches measuring 5m in width. The ditch of the barrow furthest to the east had been truncated by a horseshoe shaped mortuary enclosure. Other features in Area 6 included a posthole alignment, along with an incomplete circle of fifty stake holes, arranged around a central pit. Area 7 was located to the east of Area 6 and targeted a small ring ditch identified in the eastern section of the site. This proved to be a further Bronze Age barrow with a central burial. An Iron Age ditch was also identified. Following machine stripping, the five barrows were cleaned and photographed by drone. Once this was complete excavation began on the small ring ditch in Area 7. Although the ditch itself did not produce any finds or features, the central burial contained a poorly preserved crouched skeleton, along with fragments of pottery, a copper-alloy awl and a flint thumbnail scraper. Excavation of the two smaller barrows in Area 6 is now underway, although so far the ditches have only produced Late Iron Age and Roman pottery. 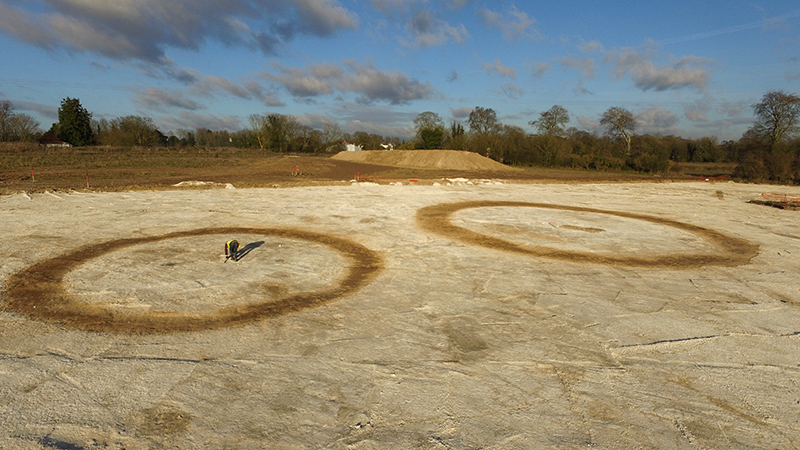 Although round barrows are common in this region, it is unusual for a commercial excavation to reveal a whole barrow cemetery, along with an associated mortuary enclosure and other probable ritualistic features. This exciting excavation provides us with the opportunity to significantly enhance our understanding of Hampshire’s Bronze Age landscape. More information will follow, once the archaeological work at the site is complete.